Undocumented is a fantastic memoir that depicts one person’s journey as an undocumented person living in America. 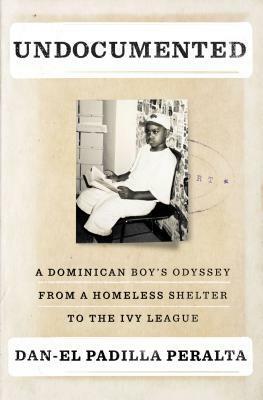 When Dan-El Padilla Peralta is a young child, he moved to New York from the Dominican Republic with his family. His family didn’t acquire US citizen documentation and soon their travel papers expired and he and his mother were eventually living in America illegally. Dan-El beautifully articulates the struggles that he encounters because he doesn’t have documentation – his mother isn’t able to legally work so they had to move into a shelter when Dan-El is young and move frequently until they are able to find a more stable home thanks to public housing; he isn’t able to “officially” work (on paper at least) when he is offered a mentorship job when he’s in high school; he has no idea how to apply to college and if he will even be allowed to attend; and more struggles that are too numerous to list (and would also spoil some of his life story if I included them here). It is so, so important that stories like Padilla’s are captured and made available to the public. Moving to the US and overstaying your initial papers and eventually living in America illegally is more common than a lot of people think. You may even have someone in your life who is undocumented and you have no idea. With Padilla’s story of his life, he’s able to share his experience with those who may not be aware of the realities that face being undocumented in the US, and also provide comfort to others who have lived those experiences. I talked about this book with my friend who was undocumented for most of his youth and he said that it would have been incredibly reassuring to know a book like Undocumented existed because for a long time, he didn’t know anyone else outside of his family who was undocumented. He told me that if he had been able to read about someone who shared his experience in some way, he wouldn’t have felt so isolated about his status and his situation. That said, Padilla is quick to remind readers that he doesn’t have the answers for someone in similar situations to him. He was able to acquire a lot of well-placed connections and a valuable support system based on his specific circumstances, which may not be widely available to everyone. His book isn’t about teaching others specifically how to navigate their own situation, but purely serves to detail his own life experiences. After the acknowledgments section of the book, there is a glossary of Spanish terms used throughout the text. Since I had an e-galley of this book, I didn’t notice this until I had finished reading. There are hardly ever full sentences in Spanish within the book, and most of the Spanish terms are sprinkled into the text occasionally in a way that isn’t distracting if you don’t know Spanish. Thus, a glossary wasn’t necessary to me, but some could find it helpful. The only thing I would have changed about the memoir is the epilogue – it felt awkward to read and seemed as if it was hastily strung together. It’s very vague about how many years had lapsed between the epilogue and the last chapter of the book and if there had been any development with one of the major plot lines of the book. I also wish there had been a greater call to action at the end of the book; Padilla speaks extensively about the DREAM Act and I felt like the epilogue could have included a request for readers to contact their local representatives about this bill or listed activism groups that they could either directly be involved with or contribute to if they desired. However, if you couldn’t tell from the rest of this glowing review, I definitely recommend reading this book. It’s well written and represents a perspective that I haven’t read before. If you’ve read books that cover similar territory, please recommend them to me! If you somehow stumbled across this review because you’re in high school and are wondering how you can ever go to college if you’re undocumented, my friend, who was in a similar situation to you, applied to universities via QuestBridge, which is a service dedicated to helping low-income students apply to college. You do not have to report a Social Security number if you apply to college this way. Good luck as you navigate this very complicated process! There’s currently a giveaway for this book for readers residing in the US on GoodReads through June 22, 2015. Expected Publication Date: 28 July 2015 by Penguin Press. This entry was posted in Advance Reading Copy, memoir, nonfiction, Review and tagged Advance Reader Copy, book, book review, citizenship, dan-el padilla, dan-el padilla peralta, DREAM act, first to read, memoir, nonfiction, penguin, Penguin First to Read, undocumented on June 20, 2015 by Bri with a book blog.